Hesiod's Theogony is a large-scale synthesis of a vast variety of local Greek traditions concerning the gods, organized as a narrative that tells how they came to be and how they established permanent control over the cosmos. It is the 1st Greek mythical cosmogony. The initial state of the universe is chaos, a dark indefinite void considered as a divine primordial condition from which everything else appeared. Theogony is a part of Greek mythology which embodies the desire to articulate reality as a whole; this universalizing impulse was fundamental for the 1st later projects of speculative theorizing. In many cultures, narratives about the origin of the cosmos and about the gods that shaped it are a way for society to reaffirm its native cultural traditions. Specifically, theogonies tend to affirm kingship as the natural embodiment of society. What makes the Theogony of Hesiod unique is that it affirms no historical royal line. Such a gesture would have sited the Theogony in one time and one place. Rather, the Theogony affirms the kingship of the god Zeus himself over all the other gods and over the whole cosmos. Further, in the "Kings and Singers" passage Hesiod appropriates to himself the authority usually reserved to sacred kingship. The poet declares that it is he, where we might have expected some king instead, upon whom the Muses have bestowed the two gifts of a scepter and an authoritative voice (Hesiod, Theogony 30–3), which are the visible signs of kingship. It isn't that the gesture is meant to make Hesiod a king. Rather, the point is that the authority of kingship now belongs to the poetic voice, the voice that is declaiming the Theogony. The written form of the Theogony was established in the 6th century. Even some conservative editors have concluded that the Typhon episode is an interpolation. The decipherment of Hittite mythical texts, notably the Kingship in Heaven text 1st presented in 1946, with its castration mytheme, offers in the figure of Kumarbi an Anatolian parallel to Hesiod's Uranus-Cronus conflict. In the Theogony the initial state of the universe, or the origin is Chaos, a gaping void (abyss) considered as a divine primordial condition, from which appeared everything that exists. Then came Gaia (Earth), Tartarus (the cave-like space under the earth; the later-born Erebus is the darkness in this space), and Eros (Sexual Desire -the urge to reproduce, not the emotion of love as is the common misconception). Hesiod made an abstraction because his original chaos is something completely indefinite. By contrast, in the Orphic cosmogony the unaging Chronos produced Aether and Chaos and made a silvery egg in divine Aether. From it appeared the bisexual god Phanes, identified by the Orphics as Eros, who becomes the creator of the world. Some similar ideas appear in the Hindu cosmology which is similar to the Vedic. In the beginning there was nothing in the universe but only darkness and the divine essence who removed the darkness and created the primordial waters. His seed produced the universal germ, from which everything else appeared. In the Babylonian creation story Enuma Elish the universe was in a formless state and is described as a watery chaos. From it emerged two primary gods, the male Apsu and female Tiamat, and a 3rd deity who is the maker Mummu and his power for the progression of cosmogonic births to begin. In Genesis the world in its early state after its creation is described as a watery chaos and the earth "without form and void". The spirit of Elohim moved upon the dark face of the waters and commanded there to be light. Norse mythology also describes Ginnungagap as the primordial abyss from which sprang the 1st living creatures, including the giant Ymir whose body eventually became the world, whose blood became the seas, and so on; another version describes the origin of the world as a result of the fiery and cold parts of Hel colliding. From Chaos came Erebus and Nyx (Night). Erebus and Nyx reproduced to make Aether (the outer atmosphere where the gods breathed) and Hemera (Day). From Gaia came Uranus (Sky), the Ourea (Mountains), and Pontus (Sea). Uranus was disgusted with his children, the Hecatonchires, so he hid them away somewhere in Gaia. Angered by this, Gaia asked her children the Titans to punish their father. Only Cronus was willing to do so. Cronus castrated his father with a sickle from Gaia. The blood from Uranus splattered onto the earth producing Erinyes, Giants, and Meliai. Cronus threw the severed testicles into the Sea (Thalassa), around which foam developed and transformed into the goddess of Love, Aphrodite (which is why in some myths, Aphrodite was daughter of Uranus and the goddess Thalassa). Meanwhile, Nyx, though she married Erebos, produced children parthenogenetically: Moros, Oneiroi (Dreams), Ker and the Keres (Destinies), Eris (Discord), Momos (Blame), Philotes (Love), Geras (Old Age), Thanatos (Death), Moirai (Fates), Nemesis (Retribution), Hesperides (Daughters of Night), Hypnos (Sleep), Oizys (Hardship), and Apate (Deceit). From Eris, following in her mother's footsteps, came Ponos, Hysmine (Battles), the Neikea (Quarrels), the Phonoi (Murders), Lethe (Oblivion), Makhai (Fight), Pseudologos (Lies), Amphilogia (Disputes), Limos (Famine), Androktasia (Manslaughters), Ate (Ruin), Dysnomia (Anarchy and Disobedient Lawlessness), the Algea (Illness), Horkos (Oaths), and Logoi (Stories). After Uranus's castration, Gaia married Pontus and they have a descendent line consisting of sea deities, sea nymphs, and hybrid monsters. One child of Gaia and Pontus is Nereus, who marries Doris, a daughter of Oceanus and Tethys, and has Nereids, the fifty nymphs of the sea, one of whom is Thetis. Another child of Gaia and Pontus is Thaumas, who marries Electra, a sister of Doris, and has Iris (Rainbow) and two Harpies. In the family of the Titans, Oceanus and Tethys marry and have three thousand rivers and three thousand Okeanid Nymphs (including Electra, Calypso, and Styx). Theia and Hyperion marry and have Helios (Sun), Selene (Moon), and Eos (Dawn). Kreios and Eurybia marry to bear Astraios, Pallas, and Perses. Eos and Astraios will later marry and have Zephyros, Boreas, Notos, Eosphoros, Hesperos, Phosphoros and the Stars (foremost of which are Phaenon, Phaethon, Pyroeis, Stilbon, those of the Zodiac and those three acknowledged before). From Pallas and Styx came Zelus (Zeal), Nike (Victory), Cratos (Strength), and Bia (Force). Koios and Phoibe marry and have Leto, Asteria (who later marries Perses and has Hekate). Iapetos marries Klymene (an Okeanid Nymph) and had Atlas, Menoetius, Prometheus, and Epimetheus. Cronus, having taken control of the Cosmos, wanted to ensure that he maintained power. Uranus and Gaia prophesied to him that one of his children would overthrow him, so when he married Rhea, he made sure to swallow each of the children she birthed: Hestia, Demeter, Hera, Hades, Poseidon, Zeus. However, Rhea asked Gaia and Uranus for help in saving Zeus by sending Rhea to Crete to bear Zeus and giving Cronus a huge stone to swallow thinking that it was another of Rhea's children. Gaia then took Zeus and hid him deep in a cave beneath the Aegean Mountains. Tricked by Gaia, Cronus regurgitated his other five children. Joining with Zeus, they waged a great war on the Titans for control of the Cosmos. The war lasted ten years, with the Olympian gods, Cyclopes, Prometheus and Epimetheus, the children of Klymene, on one side, and the Titans and the Giants on the other (with only Oceanos as a neutral force). Eventually Zeus released the Hundred-Handed ones to shake the earth, allowing him to gain the upper hand, and cast the fury of his thunderbolts at the Titans, throwing them into Tartarus. Zeus later battled Typhon, a son of Gaia and Tartarus, created because Gaia was angry that the Titans were defeated, and was victorious again. Because Prometheus helped Zeus, he wasn't sent to Tartarus like the other Titans. However, Prometheus sought to trick Zeus. Slaughtering a cow, he took the valuable fat and meat, and sewed it inside the cow's stomach. Prometheus then took the bones and hid them with a thin layer of fat. Prometheus asked Zeus' opinion on which offering pile he found more desirable, hoping to trick the god into selecting the less desirable portion. However, Hesiod relates that Zeus saw through the trick and responded in a fury. Zeus declared that the ash tree would never hold fire, in effect denying the benefit of fire to man. In response, Prometheus sneaked into the gods' chambers and stole a glowing ember with a piece of reed. For this theft, Zeus punished Prometheus by chaining him to a cliff, where an eagle fed on his ever-regenerating liver every day. Prometheus would not be freed until Heracles, a son of Zeus, came to free him. Since man had access to fire, Zeus devised woman as a general punishment, in trade. Hephaistos and Athena built woman with exquisite detail, and she was considered beautiful by all men and gods. Hesiod writes that, despite her beauty, woman is a bane for mankind, attributing women with laziness and a waste of resources. Hesiod notes that Zeus' curse, womankind, can only bring man suffering, whether by taking a woman as his wife, or by trying to avoid marriage. Zeus married seven wives. The 1st was the Oceanid Metis, whom he swallowed to avoid begetting a son who, as had happened with Cronus and Uranus, would overthrow him, as well as to absorb her wisdom so that she could advise him in the future. He would later "give birth" to Athena from his head, which would anger Hera enough for her to produce her own son parthenogenetically, Typhaon, the part snake, part dragon sea monster, or in other versions Hephaistos, god of fire and blacksmiths. The 2nd wife was Themis, who bore the three Horae : Eunomia (Order), Dikē (Justice), Eirene (Peace); and the three Moirai (Fates): Clotho (Spinner), Lachesis (Alotter), Atropos (Unturned), as well as Tyche (Luck). Zeus then married his 3rd wife Eurynome, who bore the three Charites (Graces): Aglaia, Euphrosyne, and Thalia. The 4th wife was his sister, Demeter, who bore Persephone. The 5th wife of Zeus was another aunt, Mnemosyne, from whom came the nine Muses: Clio, Euterpe, Thaleia, Melpomene, Terpsikhore, Erato, Polymnia, Urania, and Calliope. The 6th wife was Leto, who gave birth to Apollo and Artemis. The 7th and final wife is Hera, who gave birth to Hebe, Ares, Enyo, Hephaistos, and Eileithyia. Of course, though Zeus no longer marries, he still has affairs with many other women, such as Semele, mother of Dionysus, Danae, mother of Perseus, Leda, mother of Castor and Polydeuces and Helen, and Alkmene, the mother of Heracles, who married Hebe. Poseidon married Amphitrite and produced Triton. Aphrodite, who married Hephaistos, nevertheless had an affair with Ares to have Eros, Phobos (Fear), Deimos (Cowardice), and Harmonia (Harmony), who would later marry Cadmus to sire Ino (who with her son, Melicertes would become a sea deity), Semele (Mother of Dionysos), Autono� (Mother of Actaeon), Polydorus, and Agave (Mother of Pentheus). Helios and Perseis birthed Circe. Circe, with Poseidon, in turn, begat Phaunos, god of the forest, and, with Dionysos, mothered Comos, god of revelry and festivity. After coupling with Odysseus, Circe would later give birth to Agrius, Latinus, and Telegonos. Atlas' daughter Calypso would also bear Odysseus two sons, Nausithoos and Nausinous. The heritage of Greek mythology already embodied the desire to articulate reality as a whole and this universalizing impulse was fundamental for the 1st projects of speculative theorizing. 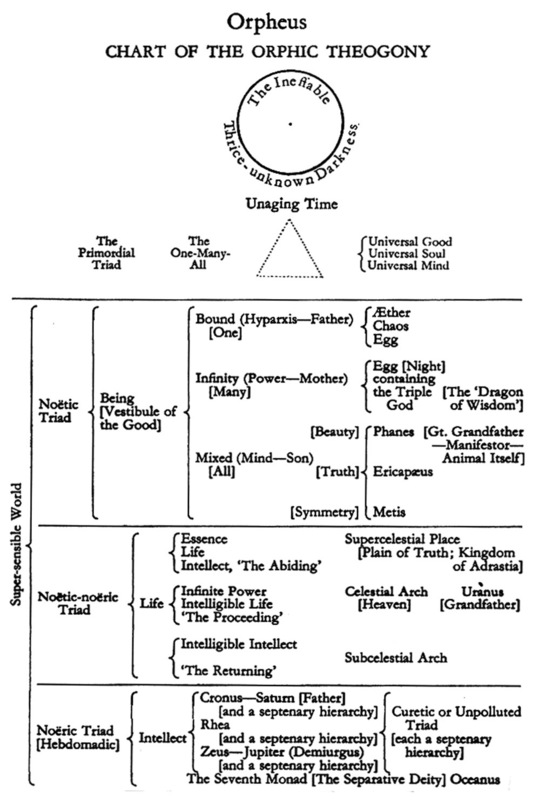 It appears that the order of being was 1st imaginatively visualized before it was abstractly thought. Hesiod, impressed by necessity governing the ordering of things, discloses a definite pattern in the Genesis and appearance of the Gods. These ideas made something like cosmological speculation possible. The earliest rhetoric of reflection all gravitates about two interrelated things, the experience of wonder as a living involvement with the divine order of things and the absolute conviction that, beyond the totality of things, reality forms a beautiful and harmonious Whole. In the Theogony the origin is Chaos, a divine primordial condition and there are the roots and the ends of the earth, sky, sea and Tartarus. Pherecydes of Syros (6th century BC), believed that there were three pre-existent divine principles and called the water also Chaos. In the language of the archaic period (8th – 6th century BC), arche (or archai), designates the source, origin or root of things that exist. If a thing is to be well established or founded, its arche or static point must be secure, and the most secure foundations are those provided by the gods: the indestructible, immutable and eternal ordering of things. In ancient Greek philosophy, arche is the element or 1st principle of all things, a permanent nature or substance which is conserved in the generation of the rest of it. From this all things come to be and into it they are resolved in a final state.. It is the divine horizon of substance that encompasses and rules all things. Thales (7th – 6th century BC), the 1st Greek philosopher, claimed that the 1st principle of all things is water. Anaximander (6th century BC) was the 1st philosopher who used the term arche for that which writers from Aristotle on call the "substratum" (Hippolitus I,6,I DK B2). Anaximander claimed that the beginning or 1st principle is an endless mass (Apeiron) subject to neither age nor decay, from which all things are being born and then they are destroyed there. A fragment from Xenophanes (6th century BC) shows the transition from Chaos to Apeiron: "The upper limit of earth borders on air. The lower limit of earth reaches down to the unlimited (i.e the Apeiron)."